Banacek when he had up ears. Banacek is a mostly white, with brown splodgy bits on his fur, that used to look exactly like someone had drizzled treacle on his back when he was a baby. Now he is an adult, it looks more like a respectable snowy camouflage. We got him in April 2012, the week after Mother’s Day (UK edition, usually 2 months earlier than everyone else has it). We bought him brand new from Pets At Home because there were no adoption bunnies in a 50 mile radius, and there hadn’t been for months and months (literally, I bought hay, toys and a food bowl for a new rabbit about 7 months before we finally gave up on getting an adopted bunny and just bought one). 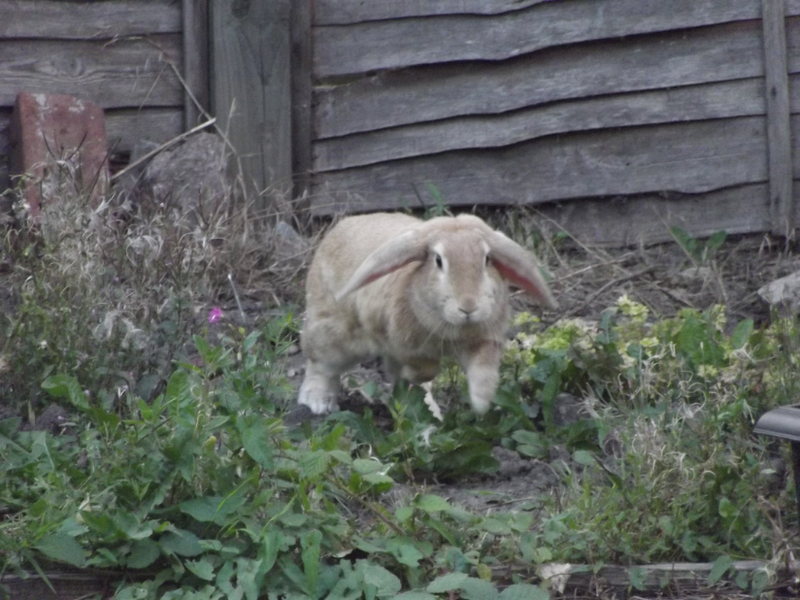 He had up ears when we first got him, but after about a year they both gradually became lop ears, apparently this happens sometimes with particular cross breeds where the genes can’t make their minds up whether to give the rabbits up or down ears. For a while he had helicopter ears, and even now, one of his ears is much more lop than the other. 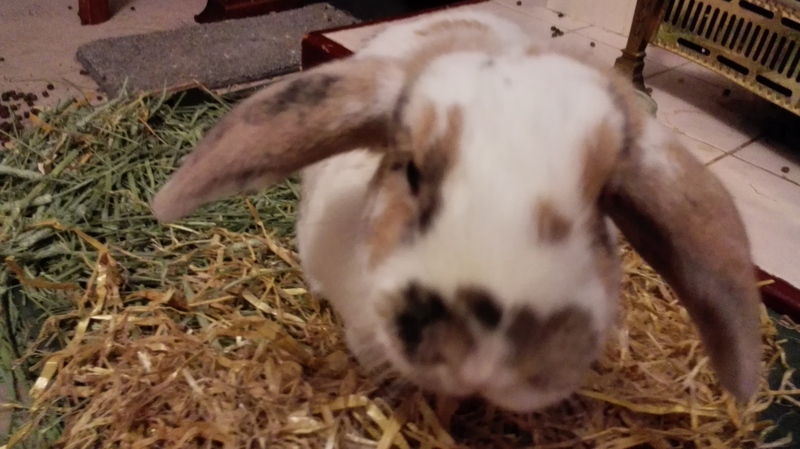 After about a year, we realised he was profoundly lonely, and given that we weren’t allowed a bunny in our house, we started to look for a new house of our very own so we could bring a friend home for him to adore. It took a ridiculous length of time but we found our perfect house and then we looked for a friend for him. 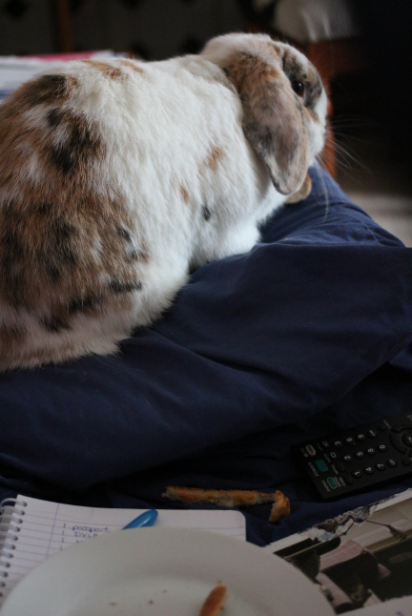 He likes to jump on the sofa and try to drink my tea (with soya milk and no sugar, of course – the bunnies are lactose intolerant and I have a milk allergy). He also has developed a habit of trying to steal my toast in the mornings. Cleo (on top of the toy) in front of her home with Banacek (inside the toy). When we were looking for a friend for Banacek, we were sure that we wanted someone who was adoptable, since we felt bad that we had bought Banacek, even though there were no adoption bunnies at the time. We looked everywhere but there were no female rabbits for adoption. Banacek was a male and we knew he hadn’t got on with other males since he’d been neutered at 7 months old, because he had regular playdates with my friend’s rabbits. At long last, we found an advert on Gumtree. 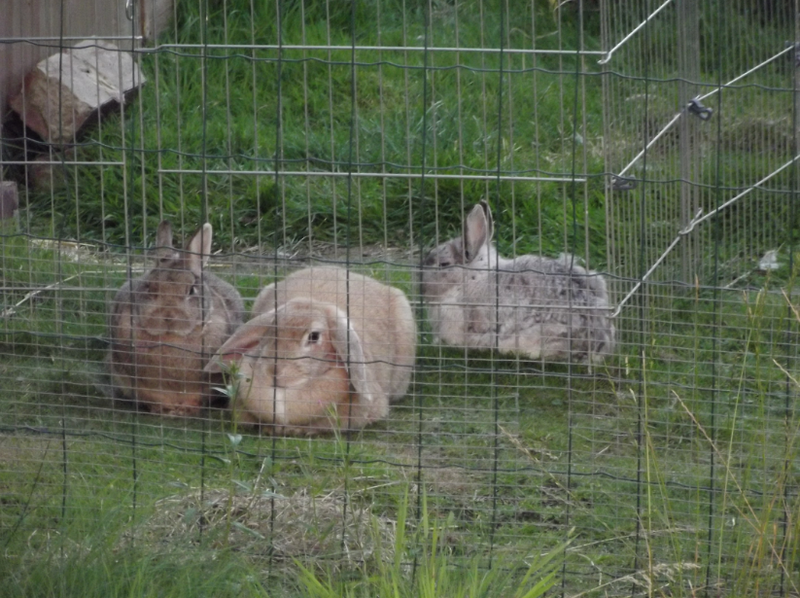 There were three rabbits up for adoption, all Netherland Dwarf bunnies, about 15 miles from where we lived. The owners were emigrating. We phoned and asked questions. We were initially disappointed, as the female hadn’t been neutered, and neither had one of the males, and the males were kept separate from the female, and they were all eight and a half years old. We knew bunnies could live to see a decade, but I also knew that this was not always the reality of having a bunny, and I didn’t want my current rabbit to be lonely again in six months if his new friend died. This was in September 2013. We asked if we could arrange an introduction, and the following day, we took Banacek on the car ride that would change his life. Cleo, Sebastian and Neville’s former owners had two outdoor runs, where the bunnies played out all day during the day, then went back to their hutches at night time. We put Banacek in to meet Cleo. 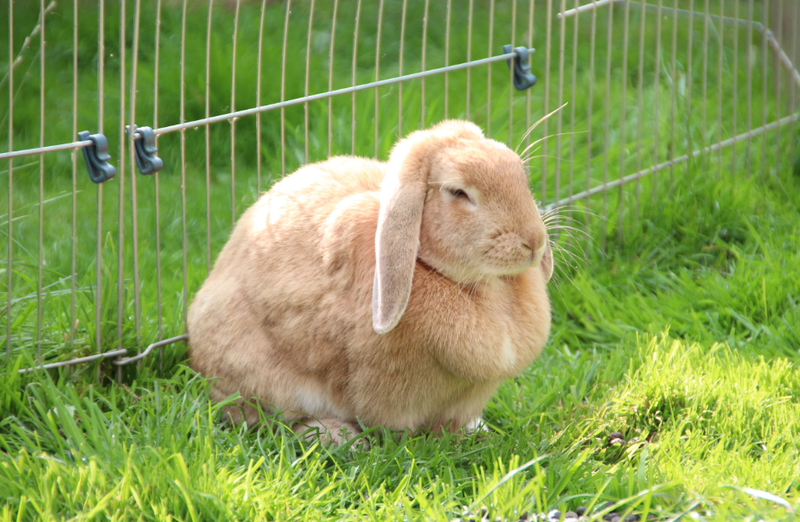 At first she was terrified – Cleo had never seen such a big rabbit! 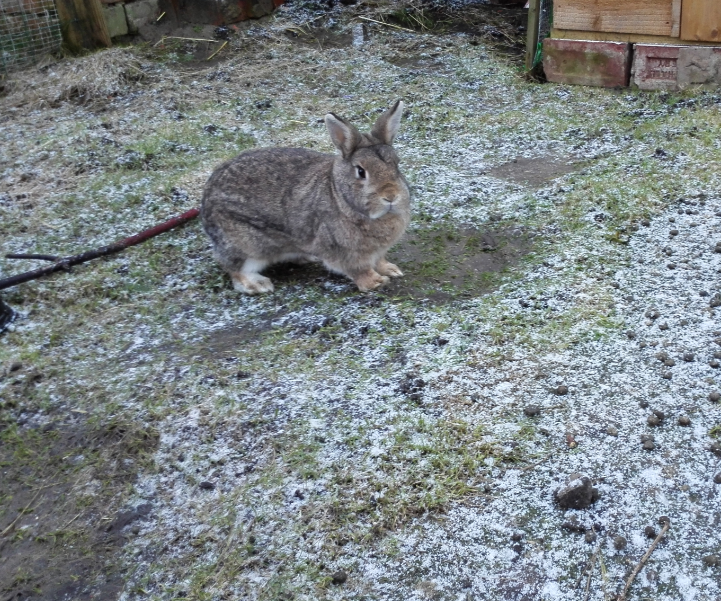 She wouldn’t stop running away and we didn’t think this was going to work – she was such an elderly bunny, and Banacek was so young and full of the joys of spring, that it looked doomed to fail. We left them alone for half an hour, though, and Cleo started offering her nose to Banacek. Netherland Dwarves do this to say hello, and other bunnies don’t do it as much, so it was astounding to us when Banacek offered his nose back! 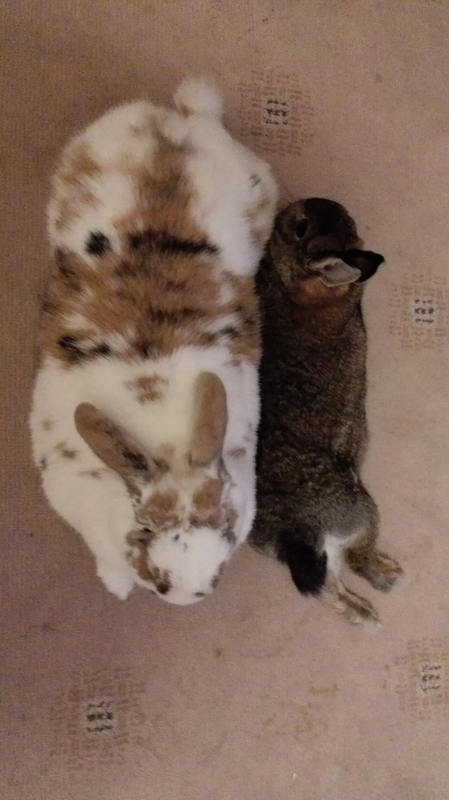 He had never done this on any of his playdates with other buns the same size as him! They soon were chasing each other as a game, rather than out of fear. 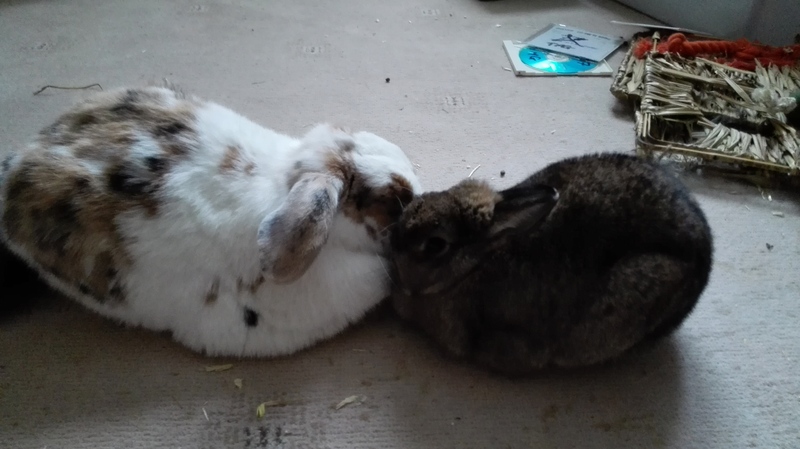 Three days later, we brought Banacek back, to check whether they were still going to get on or not, and they remembered each other straight away (which rabbit care websites claim is impossible). The hardest part was having to put them in separate boxes to get them back down the motorway to our home, as they didn’t want to be apart! We put them in the living room and let them play together. I was still worried about leaving them unsupervised so I put Cleo in her hutch outside every night at bedtime, because she is such a tiny rabbit and I didn’t want to close her into Banacek’s hutch in the living room until we knew he was happy for her to be in there – and for about two months, she showed no interest in going into his hutch to explore. One day, though, she had a bit of a cut on her nose and I wanted to keep her in as the weather was getting colder, so I put her into Banacek’s hutch, ready to pull her out again at the first sign of trouble, but she was ok, he was ok, and we came downstairs the next morning to find them snuggled together on the bottom floor of the hutch. We did have to make some reasonable adjustments to the hutch as it was designed for a bigger rabbit and Cleo couldn’t climb up to the higher platforms, but once we put extra climbing blocks in for her to get onto, she was soon on the top floor at night time with Banacek – which was his favourite spot! Neville and Sebastian were twin brothers, and were from the same litter as Cleo. When we went to get Cleo, my husband fell in love with the boys too. The only problem? Banacek didn’t get on with them. After a couple of scuffles we had to give up on the idea of a rabbit foursome in our living room, so we then had to think seriously about what to do. We decided that, if we only wanted to get rabbits to be friends with Banacek, then perhaps we shouldn’t get any rabbits at all, not even Cleo, because in our eyes they wouldn’t all be equals. We re-examined why we wanted rabbits at all, and came to the conclusion that if we brought Sebastian and Neville home, it would be because we liked them and wanted them to be happy in a new home, not with any kind of illusions that they would ever be friends with Banacek (but it would be great if they ever did). My husband decided he liked them anyway, and so they came home with us too. Neville was always the loudest, most energetic of the two. He was the one who had been neutered, and he was definitely the dominant twin. Sebastian was a quieter bunny and liked to sleep for long hours, while Neville was the most playful little bun, always starting games with his brother. More than that, they had never been apart since they were conceived by their parents. When Neville got attacked by Fifer, later on, we took Sebastian to the vet with him to keep Neville’s stress down, and kept them both in the bathroom for a while, until Neville had healed. 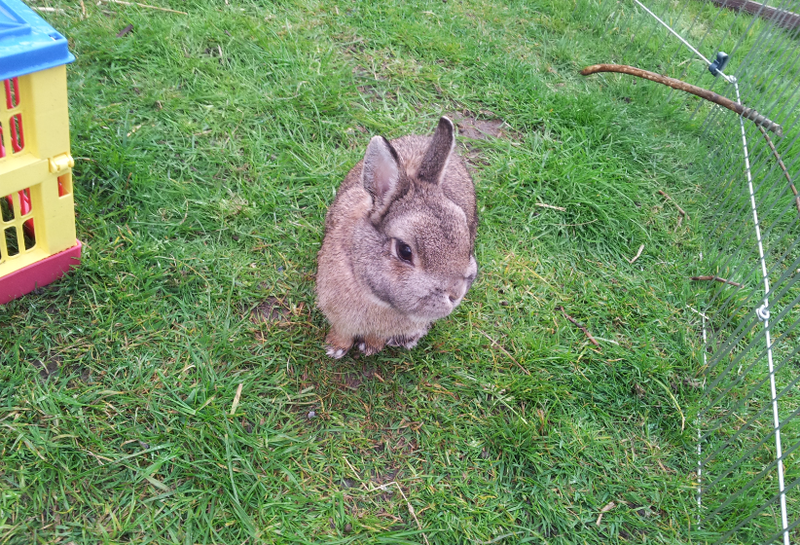 Neville went on to make a full recovery, but about eight months later, just one month before his tenth birthday, we found him dead in a corner of his hutch. We left him out for the other bunnies to see, as this helps them with their grief (if they don’t see the dead bunny, they will assume they are out somewhere, and will sit and wait for them to come home for weeks). We buried him in our back garden the next evening. We didn’t think that Sebastian would cope without Neville, and watching him grieve was profoundly sad – if we’d had to guess, we both expected Sebastian to go first, not Neville, as he was less active and often didn’t leave his hutch during the day. We thought he was winding down in life. It’s five months later, and Sebastian is still going, still just as inactive as ever. Occasionally we see him running round, but not often. We tried introducing him to other bunnies, but it turns out that he wants some peace and quiet in his retirement, and hasn’t been particularly kind to Fifer when we tried to get them to be friends. 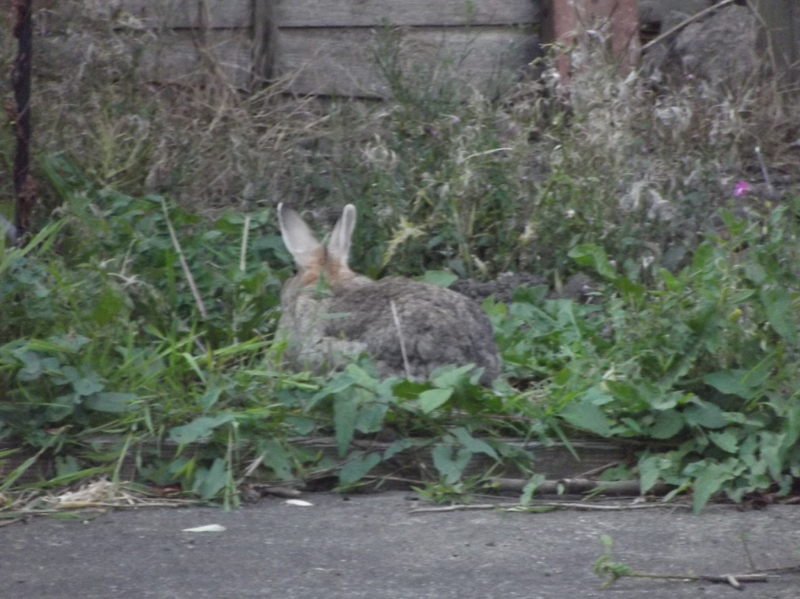 We are letting him have his own space as he seems content with the friendship that Katie and Fifer keep offering him through the fences between their rabbit runs, but face to face he is less than polite to them. Fifer, enjoying a brisk morning hop. 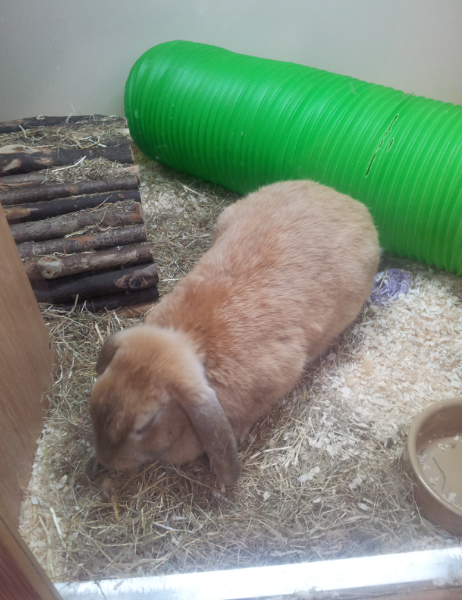 When I first saw Fifer in Pets At Home, he was 3 months old, and named Clover, and they thought he was a girl. I thought she was the most adorable little bunny I’d ever seen, and she clearly was annoyed that she was up for adoption, disliking the attention, preferring instead to hide in a tunnel so only her back legs and tail were visible. She was a beautiful wild-looking bunny, and when I asked the store manager if I could handle her, she attacked him viciously, covering his hands in angry bloody scratches in seconds. They clearly had a history. The second he passed her to me, Clover stretched out her nose and snuffled mine, to see if I was friendly. Then, when I brought her closer to me, she licked my face and snuggled into my neck. 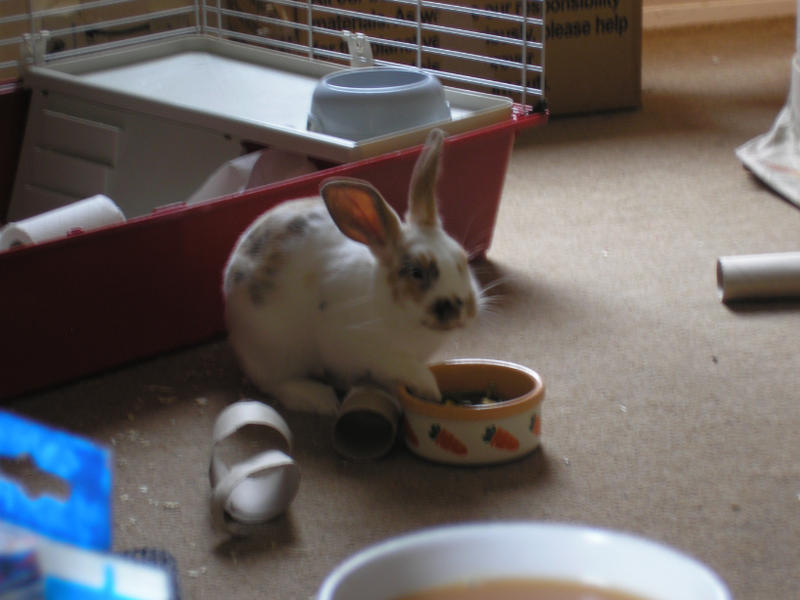 She came home that same day, I didn’t care that we already had four rabbits (and really, I had shared ownership of Banacek, who is his own bunny, Banacek has Cleo, and my husband has Sebastian and Neville, so Clover would be a bunny just for me), she was my little darling. I had high hopes that she would integrate with Cleo and Banacek, and offset how hard it was going to be for Banacek when Cleo died, as Cleo was 9 years old at this point. Hilariously, I booked her in for a spay, and cried when I gave her to the vet to sort out. The vet took a look and pronounced her male. So we changed her name to Fifer. Fifer got neutered, a procedure I was far less stressed about, and he came home and we stopped trying to introduce him to the other rabbits. We gave him his own section of the garden to play in, which he really liked. After about three or four months, though, he seemed really bored and disinterested in life. He just sat in the same spot, day after day, staring wistfully at Sebastian and Neville. We’d tried to get them to make friends before, and it had all gone wrong, so we didn’t want to try again until we were certain they would be okay. Fifer had other ideas. I came downstairs one morning to find Sebastian and Neville’s rabbit run strewn with fur, Banacek was sitting at the front of his run, staring into the kitchen window (he lived outside all of last summer) and Cleo, Fifer, Sebastian and Neville were nowhere to be seen. I went straight outside, concerned that the boys had been fighting, and I was very surprised to see Fifer sitting in Sebastian and Neville’s run, looking like that girl at the start of Battle Royale. I scooped him up and popped him on his own side of the run, and he had the sense to stay there. I opened the shed doors to get to Sebastian and Neville’s hutch and found Sebastian trying to bite my hand, clearly trying to protect Neville, who was very very badly injured and had taken himself off to a quiet corner to die. I ran to the house and grabbed a rabbit carrier, brought it back to the hutch, carefully extricated Sebastian, then even more carefully got Neville into the carrier, trying not to hurt him more by picking him up. I left the other bunnies where they were, closed the runs and gave the vet a heads up that I was coming in with an emergency, and drove straight to the vets. After 4 hours of surgery and three hours of recovery, I got a phone call telling me Neville was going to live, but we needed to keep him indoors for two weeks and give him strong painkillers and antibiotics and examine his wounds several times a day. This is what Fifer did to Neville. The saddest bit was that he lost a part of his ear. We didn’t know what to do about Fifer. We were obviously very angry, hurt and upset that he had gone out of his way to try to kill Neville, but we also knew that every time we’d tried to introduce them, Neville had attacked Fifer. Fifer had learned this behaviour from Neville. My husband suggested taking Fifer to the RSPCA, and we discussed whether we thought that what he had done was bad enough to warrant him being put to sleep. I was heartbroken, and I didn’t think it was fair on Fifer, that he was such a young rabbit, not even a year old, for his life to be over when he had his whole life ahead of him. It was the hardest thing we had ever faced with our rabbits, and I felt awful for bringing Fifer home in the first place. I think this was when we realized he was at least a half-wild rabbit, and when we researched them, we found out he has the right shapes and behaviours to be at least part wild. Our best guess is half-wild, half-Netherland Dwarf. Despite all my negative feelings, I also felt that I had a responsibility towards Fifer. He was my bunny, where none of the others were in the same way. I went out to see him after two days of not looking at him when I fed him, and I picked him up, and I just held him and cried, because he was my little bunny and I didn’t know how he could do such an awful thing to another bunny. He just snuggled me, but I could tell he knew he’d crossed a line. But I’ve crossed lines in the past, and felt like there was no redemption in sight, like I would never be able to make things right, and I knew how Fifer felt. So I made the decision that any mother would. I bought him a bigger, new hutch all of his own, I got my husband to build it, I placed it in the living room, and I moved Fifer indoors. I decided that if he was too wild, then we needed to bring him in so he could be around us and learn how to be more domesticated. After about three months of taking it in turns with Banacek and Cleo to be indoors for the day, and always sleeping indoors at night, Fifer had shown a great improvement in his behaviour. He stopped acting in fear and started feeling more confident. That was about the time when I saw Katie. Katie was (you guessed it) another adoptable from Pets at Home. She actually came from the same holding enclosure as Fifer. Her story was that she was dumped outside my vets in a cardboard box one night, so they passed her on to Pets At Home. When I first saw her, I was very excited because I thought she was the perfect size to be safely paired with Fifer. When I took Fifer for his vaccinations, I asked the vet about her, and she said that Katie had a lovely temperament and would probably get on with Fifer. The best guess is that she’s two years old, but nobody really knows. She was already microchipped and neutered when we got her. I went to Pets At Home and arranged an introduction between Katie and Fifer. There was uncertainty, there was scuffling, but ultimately, Fifer learned that this ginormous female marmalade bunny was just immune to his aggression. She would literally just lie down and ignore him. When she got bored, she’d lunge at him then go back to sleep. After two hours of introduction, we decided they were getting along. We didn’t take her until the Saturday, when we took Fifer back, expecting to have to re-introduce them. They remembered each other, though, and shared a bowl of vegetables. They were so friendly, I brought them both back in the dog box that we’d brought Fifer in (Katie was too big for those cardboard Pets at Home boxes), and when we got home and I opened the box, they just lay in there together for about an hour before coming out. 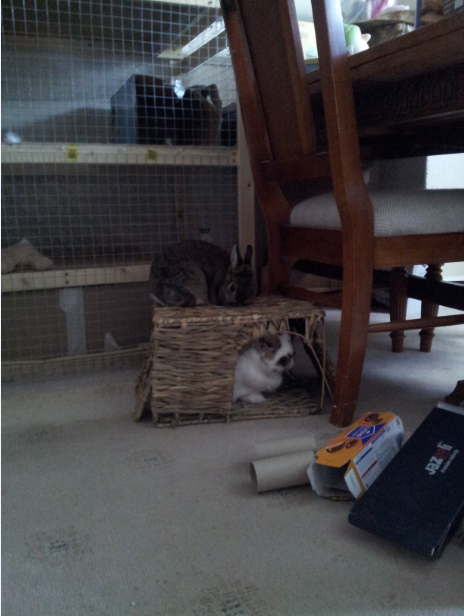 Katie moved into Fifer’s hutch straight away, and they’ve never been apart since. Katie thinks she’s the size of Fifer, and he seems to think he’s the size of Katie; she’s very timid, and I don’t know what happened before we got her, as she has a lot of fears and hang-ups, but Fifer looks after her and makes her feel safe. 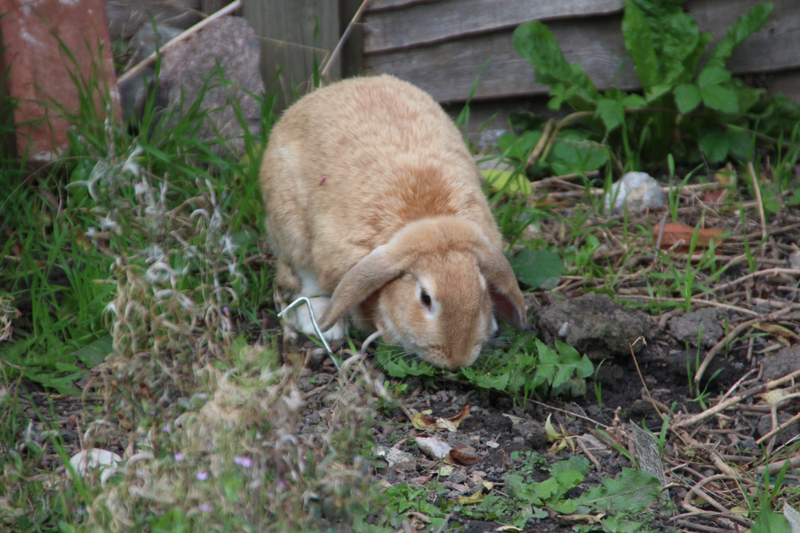 In return, she seems to have helped Fifer to become a kinder, more loving rabbit. I would never separate them. Katie and Fifer in the living room after a hard day’s play. So that’s all our bunnies. We reconfigure who lives where on a regular basis so they all get their fair share of life indoors and outdoors, and we’ve just bought a new hutch (a £30 fixer upper two storey ex display model, down from £99, from Pets At Home) so Banacek and Cleo can move out for the summer to keep them cooler, and so we can get Katie and Fifer back indoors and spend more time with them. A happy V shape for the nose. An upside down V shape for the mouth. A floating lifejacket for a ruff. Curiosity, warmth, a desire to make things better. Snuggle it up. It’s a rabbit. Trigger Warning: This story may trigger feelings that you need to help animals in some way, shape or form. 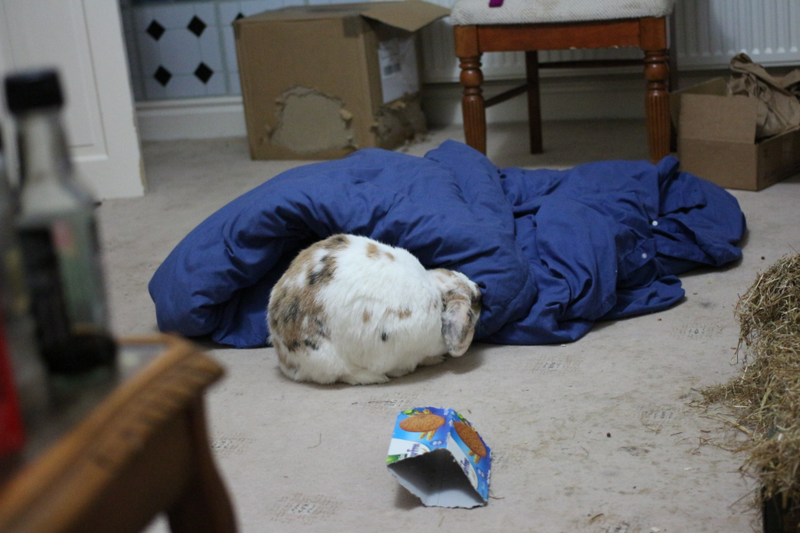 This is what part of a rabbit’s ideal environment looks like. RIP Katie bunny. Katie was dumped in a box outside my vets and I adopted her. She would still be alive today if someone hadn’t mistreated her when she was young. My earliest memories are of my mother, my brothers and sisters. We had shared a womb. So comfortable and soft, I felt perfectly safe and happy with them. Sometimes we would push each other out of the way to get milk, but we loved each other really. After a few weeks, tiny, scared and helpless, we were all lifted up and put into a metal box. It hurt our paws. We looked to our mother to protect us, but she just stayed where she always did, unresisting, submissive, she had seen this all before. We were put into a lorry. A yawning metal monster. There was darkness, and noises. Terrifying noises. Squawks, squeaks, squeals. As we stayed in the lorry, I realised they weren’t predators, they were the sounds of frightened animals. More creatures, taken away from their home too soon, left in this dark place which lurched and tipped sideways, leaving us struggling to balance. One of my brothers hurt his foot in that dark place, when the lurching stopped abruptly, and the monster we were inside let off an ear rending honk for what seemed like ages. My brother lost his balance and got his foot trapped in the bars in front of us. He struggled, and got free, but his foot looked very swollen and painful. At long last we stopped. Light came in as the back came off. We were moved out of the lorry. They picked me up and turned me upside down, I thought my spine might break then I felt sleepy, but I was so afraid that I tried to fight it. They told me I was a girl and put me in a new box. When they came to my brother with the hurt foot, they poked at his foot and called him damaged goods, unsellable stock, and they held him high in the air. They let go. Later they told this important looking inspector that they had dropped him while he was wriggling. It was classed as an understandable accident. My brother, dead on the concrete floor. My brothers and sisters knew what had happened, and were all very scared. They were treated as I had been, and either put in the same box as me, or put in a separate box. Then we were all put out in a bright place with lots of tidy shelves. We didn’t go on the shelves though. We were left in a small enclosure with glass windows. There was no roof. The lights were bright but it was warm and there was lots of golden sawdust on the floor, some toys for us to play with, a food bowl and a weird metal tube. We huddled together for hours, all the girls, and in the next pen, I could see that the boys did the same. We didn’t know where we were, what was going to happen to us. When someone opened the front we all stomped and cowered even further away from the glass windows. They poured some brown stuff into our bowl. Put some yellow stuff down on the sawdust. Closed the front again and left us. One of my sisters sniffed the yellow stuff. She indicated that it was supposed to be grass, by chewing it. The rest of us were very surprised. Surely there was some mistake. Grass was green. We had seen it. The light was strange here, too. We were all very hungry, so gradually we unhuddled to try this yellow grass. It was dry and flavourless. We ate it anyway. Soon we were very thirsty, so we drank from the metal tube. It was much bigger than the one we’d had before, and we all struggled to drink from it, but there was no choice. Later, different people came in. Small people who shouted and banged on the glass a lot, they were terrifying. One of my sisters got picked up by one. The small person hit her because she tried to struggle away from the uncomfortable grip. The person who fed us was not looking. My sister was taken away in a cardboard box by that small person. She was terrified. We never saw her again. There were also tall people, who towered down over the open top of our enclosure. We were afraid that they might eat us. Sometimes there were dogs, walking on their leads. They paralysed us with terror, especially when they tried to get at us and started barking. We were trapped. If they jumped in here, we would all be dead. We felt so vulnerable. Dark time was worst. It was cold, and we all jumped at every noise, terrified of the murky shadows we could see beyond our enclosure. Above us, some rodents would dig and chew and run on their wheel at night. We found ourselves relieved in the morning when the light came back. That second day, someone took me and my sister away in a box. We were scared, and we stayed close to each other for safety. We didn’t really see where we went, although we were bumped and tilted a lot so we guessed it was like that terrifying lorry monster again. We wondered if we had been bad, if this was our punishment. Maybe we hadn’t groomed each other enough. Or eaten too much food. The top of the box was opened at long last. We were face to face with a face. It was bigger than either of us. An enormous hand reached in and picked up my sister, then, empty, it came back for me. I fought it with my feet to try and escape, but it squeezed me so hard that I couldn’t breathe. It put me down in a small wooden box. There was a very low ceiling, and the back of it was also made of wood. They closed the front – a wire mesh door – and clipped a small water bottle to the front. There was food and hay and sawdust, but there were no toys or other bunnies. Just me and my sister. We chewed at the wooden walls. Then we went to sleep. We waited for something interesting to happen. Two days later, someone came out to see us. It was a small person, but not as small as some of the other ones we had seen. We were squealed about. Then the mesh door was opened, and a hand reached in. It pulled me out and ensconced me in a squash. There was a second hand, which stroked my back. I liked that. I wiggled my nose and clicked my teeth together and enjoyed the attention, even though I disliked being picked up. Then I was put back in the hutch and it was my sister’s turn. She was stroked then returned to the hutch. The mesh door was closed again. Was that it? We were bored. Really bored. We had nothing to do. We groomed each other until our coats shone. We slept until we were the most beautiful bunnies. We scratched at the floor and chewed at the wood. We were still really bored. We both wanted to explore, to forage, to run really fast, to chase each other, to flop on the solid ground and all we could do was chew our hutch. The one who had stroked us… she was coming back, wasn’t she? She seemed happy about us. She did come back out that evening, and gave us lots of the yellow hay and lots of the brown food and stroked our backs a little bit. We were still a little wary but she seemed not to want to harm us. A week later, she let us out in the garden. At first we were afraid that we were not allowed out. We had been in that tiny box for a week. We grew bold. We ran around chewing green grass and playing chase with each other. After a while, she caught us both and stroked us and put us in our box again. That had killed half an hour. It was over too soon. We were bored again. 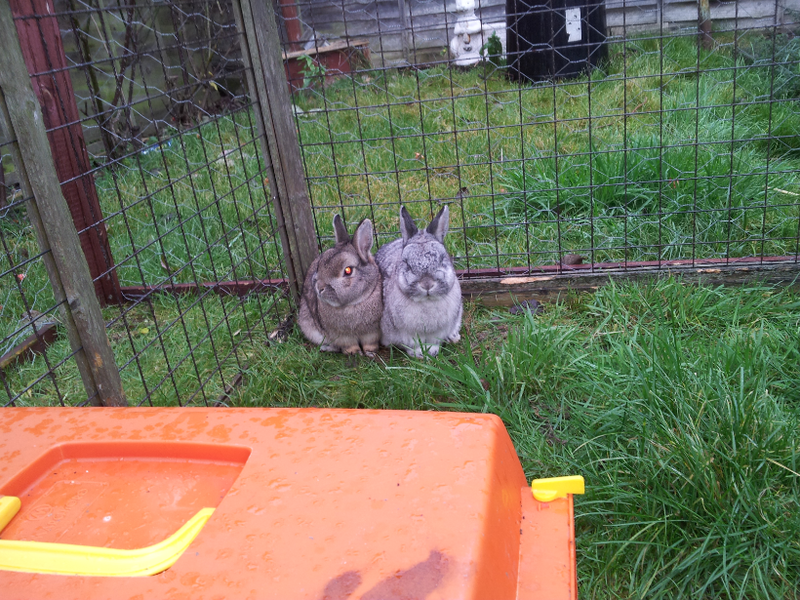 We chewed our hutch some more. Every day, she came to feed us. Then one day, she didn’t come. 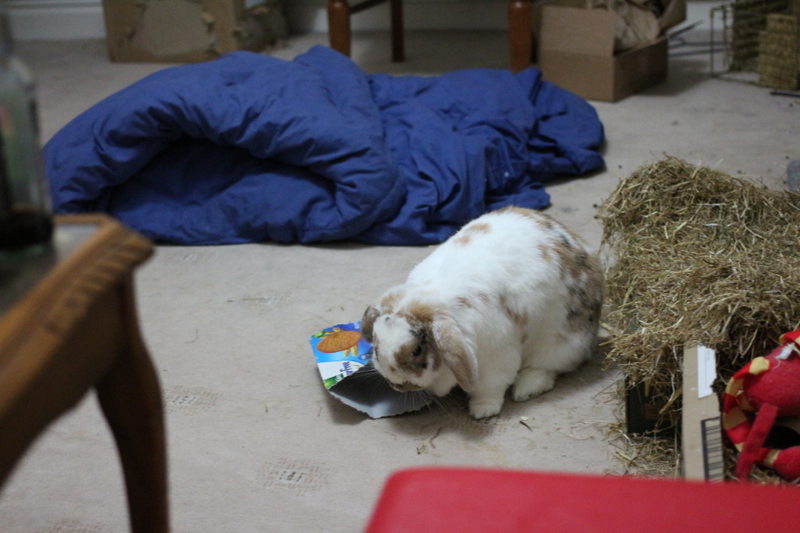 We were so hungry that we chewed our hutch extra to ease our aching tummies. The next day, she didn’t feed us extra, just the normal amount. We didn’t know what had happened. A few days later, it happened again. We started to realise that we couldn’t depend on this small person at all. We were hungry. Then our bottle went bad, and all the water tasted funny and made our poo sloppy. The tummy ache started to become constant. And all the time, nobody cleaned out our hutch. We tried to keep each other clean but we were fighting a losing battle because only our sleeping corner was clean. My eyes watered and I sneezed and wheezed a lot. After long weeks, the man who brought us here came out. He let us run around the garden. We were so happy we ran and played and nibbled plants. He seemed to be emptying our box. Then he saw where we had chewed it. He hit us both and told us we were bad rabbits, but we didn’t know what we had done. Had we eaten the wrong plants? Should we have stayed in the hutch when he opened the door? He didn’t seem to be making an effort to catch us or put us away. We were both confused. We decided to put it out of mind and we went off around the garden again playing. Slightly more afraid now of this tall person. Then he filled our box with new sawdust and hay and food, and put our bottle back on the front, and herded us back into the box. We were bored again. 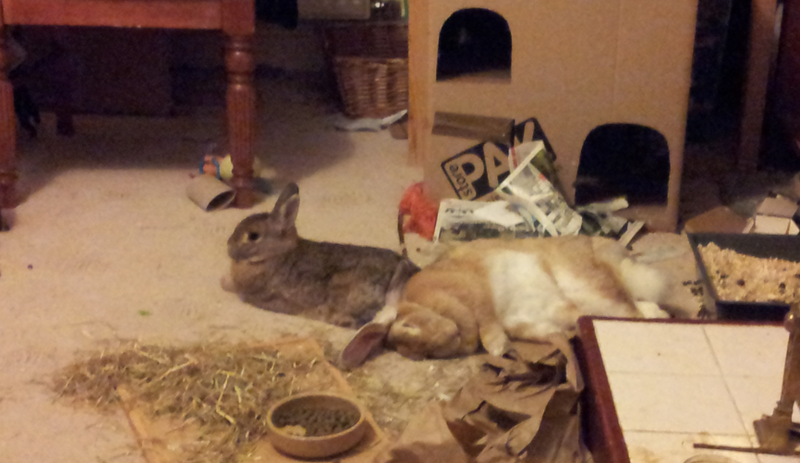 We slept and chewed our hutch some more. From that day, the tall person brought us food. He never stroked us or spoke to us like the girl had. He just threw the food in, closed the door and left. We didn’t really understand, but we had each other and that was the main thing. As we got older, we started having little arguments. Sometimes she would scratch my ears and sometimes I would bite her nose. We were getting quite large, now, and it was a struggle to fit us both in our sleeping place. We certainly couldn’t stretch out like we used to. Our backs ached from always being hunched over. We dreamed of running around the beautiful garden that we could see, but instead we were stuck in a wooden box that was too small for us. Weeks turned into months. That first winter was the most awful. The cold made us both cry and flatten our ears against our backs, but we had to sit out in the cold next to the bare wire mesh door, because our sleeping room was too small and we could barely sleep in there, let alone hang out. We craved more food, but every day the tall man just threw the same amount in. The rain came in and made our home damp. My sister got a wheeze. The man didn’t notice. Eventually, she was struggling so much to breathe that she died. I tried to raise the alarm but nobody came. I stomped my foot for hours, but nobody came. The man threw food in, and didn’t notice. It was a week later, when maggots were eating my sister’s body, that he finally investigated the smell, and saw that she was dead. He pulled her out and tossed her in a tall thin plastic box full of black plastic bags. I don’t think he was sad. I was the only person who mourned her. All the hopes we’d had, all the things we had wanted to do – to chew, to climb, to snuggle, to run as far as we could. She hadn’t even finished growing – as I found out when the box I lived in got even smaller. Now, I was sad and lonely. I didn’t eat my food. I didn’t drink anything. I didn’t even chew my hutch any more. I just sat there and did nothing. I stared out at the garden I would never get to play in, wishing I could have my sister back. I keened for her loss. And I was so cold, now that she wasn’t here. I missed her profoundly. Nobody noticed or cared, until the man who brought the food saw that my bowl was overflowing. He tried to put the food in my face but I wouldn’t eat it. He put me in a smaller cardboard box and I hoped we were going back to see the rest of my brothers and sisters. That would have made me feel better – just to know there were other bunnies in the world who loved me. Instead, we went to a place that smelled of fear, death and, predominantly, dog. There were dogs everywhere. Barking, whining, walking, wagging their tails. I cowered in my box and stomped my foot so they would know I was really large and not to mess with me. The man took me into a room and pulled me out of the box. Another man looked at me, held me, turned me this way and that. They made people-noises, the new man seemed irritated, then he put me back in the box. He said a lot of things to the man who had thrown food in my wooden box. The food man left me there and I never saw him again. Apparently if I wouldn’t eat his food he didn’t want to know. The other man put me in a new cage near some cats and dogs. I was terrified of the smell, but they didn’t seem to notice me, maybe they were asleep. The man, who I discovered was called a vet, brought me green plants and gently stroked me. Nobody had stroked me for months. I was so excited that I wanted to nibble the green plants, but the dog smell stopped me. What if this was a trap to find out if I ate plants? Dogs ate things that ate plants. I decided it wasn’t worth the risk. I went to sleep. Hours later, I was awakened to find that I was moving again. I stopped moving at another brightly lit big place. I could smell rabbits, as well as cats and dogs. I nibbled my green leafy plants. Over the next few weeks, I went back to the scary dog place, where they made me go to sleep and when I awoke I felt so ill that I thought I must be dying. 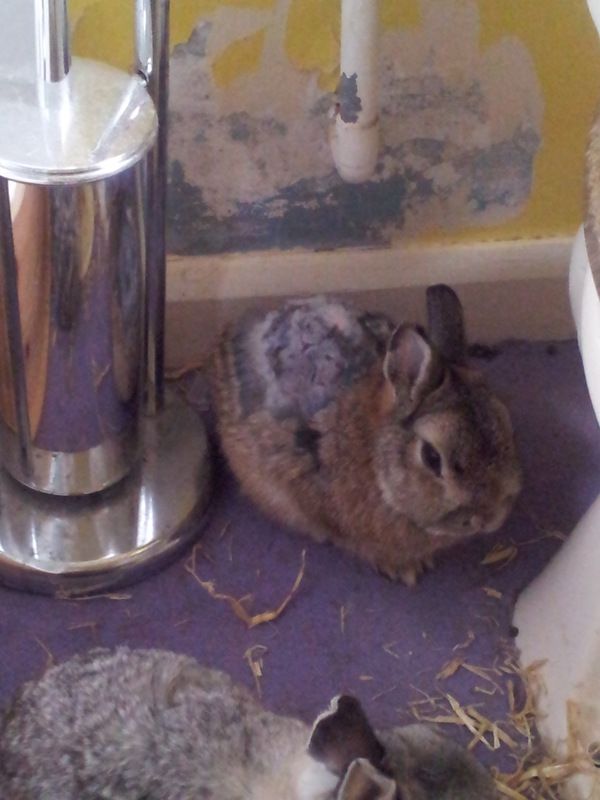 I sat in a corner of my new cage for days, feeling sorry for myself. It hurt so much and I felt like something had been taken from inside me – like I’d been violated somehow. Then after I got over that, my life changed forever. Another bunny came to see me. He seemed as surprised as I was about being in the middle of an unfamiliar room, with an unfamiliar bunny. I said hello with my nose. He didn’t bite it. That was a good start. We sat staring at one another for long minutes, until he came towards me. I was afraid so I ran away. Round and round we ran, until he stopped chasing me, and I cautiously hopped towards him. I sniffed his face. Then I sat down next to him. He seemed okay. We stayed like that for a long time, until one of the tall people here put us both in my cage. It was much bigger than my old box in that garden. I spent a lot of time sat next to my new friend, even though there was so much to do. Early in the morning we would run around in huge fast circles. Later on, we would chew some cardboard and make nice shapes out of it. Then we would eat together, then we would wash ourselves and snuggle up. I wished my new friend could have met my sister; I know they would have been friends. One day, someone new came, and they picked me up. Then they picked up my new friend. I was suddenly very afraid that we were going to be separated, and I didn’t think I could bear it. I licked my friend’s head as soon as he was back on the ground and he stomped to show them that his place was with me. Whatever we did must have worked, because a few days later, the same someone came back with a plastic box with some hay in it, and we were both encouraged into the box, then we were taken on another journey. At the other end, the box was opened, and the landscape was the strangest I’d ever seen. The floor was squishy but slightly coarse and beige. The light came from a big square on the wall, a bit like the door on my box where I used to live, but there was no fresh air coming from this square. There was a huge thing that had lots of platforms and ramps, and a little white picket fence in front of it. On the floor, just inside the picket fence, there was a food bowl and a water bowl. They had pictures of orange triangular things on them. There was also a green leafy thing on the floor that looked like some sort of vegetable. In a basket made of thick hay, there was lots of green stuff that looked like it actually used to be a plant! I was quite afraid that we weren’t supposed to have come out of the box, this was all so big and open. Would we get hit for escaping? I was very hesitant, but my new friend was braver. He hopped right on out towards the food bowl and rubbed his chin over it. I wasn’t having that, so I copied him, so he would know it was MY food as well. The people were watching us and making their strange people noises. I was still scared, so I ran for the smallest place I could see, and hid there. Eventually, the people went away but I stayed hidden in case it was a trap. My bunny friend seemed to be less scared than I was. The distance between me and the walls and the ceiling was making me feel queasy. It was the biggest box I’d ever been left in. Was it really all for me and my friend? After a few hours, the people came back in. I knew it! I stayed in my hiding place. They left again. They had brought us some more vegetables. I wondered if they would get angry and send us away if we didn’t eat them. I stretched my nose out and sniffed. The food seemed so far away. I stretched some more. Then my back legs had to follow and they sprung back to the rest of me. My back was sore from stretching out. I tentatively nibbled some of the green stuff. I don’t quite know what happened because I swear I only tasted it, but it was gone really quickly. I think it ate itself. It was very tasty. I hoped there would be more. Running round was so much more fun with a huge space to run in, and I really liked climbing, too, once I got the hang of it. After a few days, I became quite confident and I started to climb on everything. I found a really good vantage point at the top where I was the tallest bunny ever, and I laid out there, relaxed, with a great view of any intruders. My bunny friend joined me, and it became our main hangout. What I liked best about our new home was that the people who brought us food would also come and sit with us. If we were lying down, they would gently stroke us both, and we would click our teeth appreciatively. I wished my sister had lived to see such happiness. The other thing they did, was they talked to us in their odd people noises. They had a sound for everything! We learned that we had names, and we learned that we felt very happy when we were told, “good bunny” because it was always accompanied by a stroke or a treat. 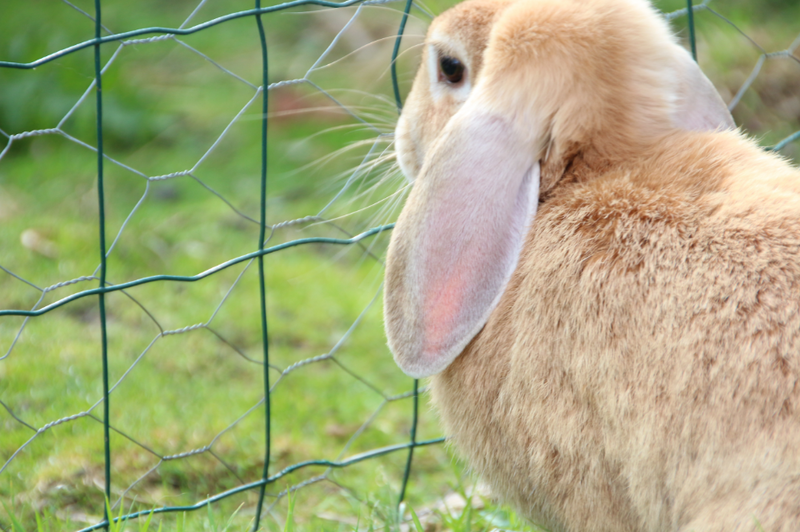 We also learned to feel very sorry for ourselves when we were told “bad rabbit” because the sound was barking, like a dog, and there were no strokes or treats for bad rabbits. Years came and went. I enjoyed every new day and the possibilities it brought. I loved the new and thoughtful toys that my people brought me, and I really felt like they were a part of our herd, even though they didn’t sleep with us. Sometimes, we saw the rest of their burrow, and it was huge. Everyone had their own separate nest space and there was a communal one down lots of small platforms, one after the other, that I learned to run up and down really quickly for fun. Near the communal nest space was the food place. It was full of food. Sometimes the smell upset me because it reminded me of the smell of my sister when she was dead. Usually, though, the smell was exciting and made me look forward to my own food time – even if I never had the same food as them. Well, unless I hopped up and ran off with a leaf or a slice of carrot. I was so happy in my new home, and I thought how lucky I was to get such a wonderful place to live. There are millions of rabbits who don’t make it this far in life, whose owners leave them in a wooden box at the bottom of the garden, who maybe throw some food at them if they remember. They live sad, pointless, lonely lives of boredom and lack of fulfilment. The only reason I can think why people do that to us is because their own lives are the same, and they don’t see why animals should be happy if people aren’t. Worse still, they “free” rabbits into the wild, where they get eaten before they can even find their way, or where they die of diseases that people invented to kill wild rabbits, or they do all sorts of other unimaginable things to bunnies who have no voice of their own. Occasionally, though, you will find your person, and they will sit with you and tell you things, feed you intriguing vegetables and take you out to interesting and safe outdoor spaces, they’ll stroke you and make you toys, and love you unconditionally, and understand when you get scared and bite or scratch them, they’ll never shout at you or hurt you, and most of all, they will be glad that you are around. And when you find a person like that, the days fly by in a flurry of excitement until one day you are old and fat, and you have led a longer and happier life, full of love and fulfilment. Fifer’s first day with us after we adopted him two years ago.